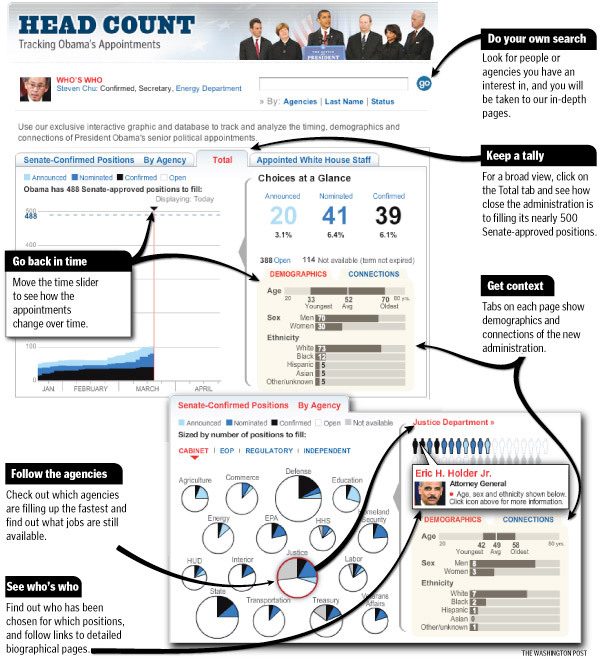 My group interactive Head Count – Tracking Obama’s Appointments from March 2009 received an award from the SND: The Best of Multimedia Design Competition Q1 2009 in the 2a “news” category. This makes it eligible for the annual contest. Not bad for a project that’s gotten over 500,000 page views in 3 months! An incredible set of data coupled with innovative presentation, tracking mechanisms and layers of detailed biographic and editorial information.Comprehensive, sophisticated example of a database-driven graphic. So much information, so many ways to explore it. The cross-linking and interconnectedness of the information is impressive. All in all, an impressive database graphic. See my earlier post about this project. The Washington Post won 12 awards from SND’s annual contest this year. The Society for News Design awarded NewsArt where I work 5 individual graphics awards and one “staff graphic portfolio” or general art department excellence. One of these was for Laura and Brenna’s Operation Turkey graphic which I promoted here last year. Laris and April received one for their full-page map of the Cherry Blossoms last spring, too. 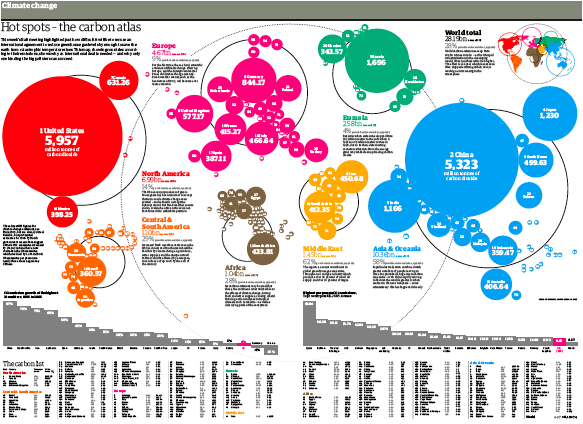 While viewing other entries we came across this double-page spread from Mark McCormick’s December 15th, 2007 graphic in The Guardian (Britain) titled “Carbon Atlas” showing off a style of cartogram named Doring after Danny Dorling now of The University of Sheffield (download full res PDF). (From NCGIA) A Dorling cartogram maintains neither shape, topology nor object centroids, though it has proven to be a very effective cartogram method. To create a Dorling cartogram, instead of enlarging or shrinking the objects themselves, the cartographer will replace the objects with a uniform shape, usually a circle, of the appropriate size. Professor Dorling (…) suggests that the shapes not overlap but rather be moved so that the full area of each shape can be seen. Note how the world map below shows true geography and establishes the region color code. Graduated circles, by region, establish proportions between regions and later iterate onto the background of the Europe detail image. Circles are labeled by rank on the main map (Europe clip below). Graduated circle labels could have been augmented with the 2 digit county code in many cases (e.g. 64CH for Switzerland). Use the table at the very bottom to lookup the rank number by continent to get the country name, total tons of C02 emissions, and ton-per-person equivalent. I prefer this automated charting method as it emphasizes proportions while still approximating geographic relationships (spatial proximity) yet avoiding the abstract art distortion noise common in the fish eye method. Some cartograms do a better job preserving shape while scaling it proportionally to the data theme like this map of Oil Reserves where a fish eye algorithm might have guided creation of final art but the original shapes are better preserved. Automated routines are available for the Dorling method (including non-overlap) and the fish eye method. Prof. Dorling is now involved in WorldMapper.org which uses a fish-eye lense effect to generate cartograms like this one. Some areas like Africa are relatively easy to digest. The Americas have turned into an ink-blot fractal. 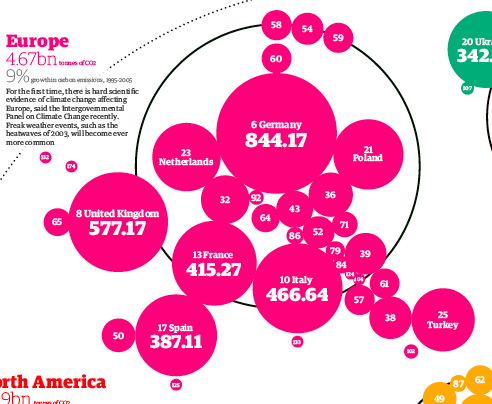 High marks for thematic coverage in the online atlas project, though. The fish eye artifacts are partly negated in this project by comparing so many different maps in sequence, especially with the selective use of animation.